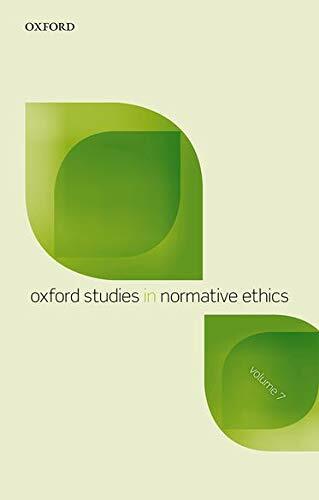 The Oxford Studies in Normative Ethics Series is annual publication of new work from philosophers in normative ethical theory. It is designed for scholars and for students working in moral philosophy. This collection of thirteen essays is the seventh in the series, edited by Mark C. Timmons. The thirteen essays in this collection were presented at the 2016 meeting of the Arizona Workshop in Normative Ethics. The seventh volume of the series begins with a concise introduction to its contents. As promised, the contributions to the volume cover a wide range of current moral issues and positions in normative ethical theory. Contributions include: a critique of the 'logic' of instrumental practical reasoning (Jonathan Dancy), a criticism of Bernard Williams' 'one thought too many' complaint about the tension between impartiality and the effect of personal relations (Marcia Baron), a development of Rawls' theory of the 'moral concept of right' (Adam Cureton), an attempt to identify what is wrong about lying that examines paradigmatic cases (Sarah Stroud), a defence of 'trying' to do the right thing where the appropriate moral action is uncertain (Andrew Depielli), and of 'trying' to do the right thing as a matter of subjective obligation (Elinor Mason), an attempt to justify the normativity of non-deontic but commendatory reasons for action (Margaret Olivia Little and Coleen Macnamara), an analysis not of how, but of when, one benefits from the satisfaction of one's desires (Eden Lin), a proposal of a way to interpret moral counter-cultures in which social contractualism is retained (Jussi Suikkanen), a proposal of a way to account for the creditworthiness of moral behaviour (Jonathan Way), an argument that one's concern for one's self can be defended by appealing to an 'impartialist' account of the value of personal autonomy (Stephen White), a study in virtue ethics of the metaphysical and epistemic priorities which inform the character of traits and actions (Gopal Sreenivasan), and a defence of hedonism and well-being against alternative forms of moral 'monism' and 'hypersensitive' moral pluralism (Theron Pummer). Taken together, the contributions to this volume offer a helpful representation of current moral issues and positions in normative ethical theory. Contributions that are particularly meritorious include those by Jonathan Dancy, and Margaret Olivia Little and Coleen Macnamara. The brief precis of Jonathan Dancy's contribution, given below, testifies to the originality and the quality of all the contributions to this volume. First, however, it is important to note that because the scope of the volume is deliberately wide its contributors have tended to address concerns that are quite diffuse. This is probably the result of the programme of the workshop from which the contributions to this volume came. No explanation is given. Excepting the contributions by Andrew Depielli and by Elinor Mason, each is a treatment of an independent topic in normative ethical theory. For these reasons the contributions, if taken together, are perhaps suitable only for those students or scholars who are concerned to take a general interest in normative ethical theory and its contemporary debates, whose desire is to learn more about which issues and which arguments have currency; and, accordingly, the volume is perhaps suitable only for the general reader. With this having been said, it would also probably be useful to students or scholars who, having taken an interest in a specific topic or a specific contributor, are willing to read this volume for the one (or two) contributions which are relevant to their own academic interests. Nonetheless, as a collection of works, the volume is digestible and informative, and its contributions contain, for the most part, a minimum of exposition and summarisation. There are extensive references to the surrounding literature by most of the authors. Most of the authors provide important and original additions to their fields, or present analytic arguments for the appropriate distinctions to utilise in those fields. Jonathan Dancy's contribution, "Forms of Instrumental Reasoning", utilises the moral particularism for which he is known to examine what it means for anyone to make decisions in practical reasoning as opposed to what it means for anyone to make derivations from beliefs in theoretical reasoning. Dancy is concerned to distinguish between the concern of practical reasoning for selecting favourable actions to take, and the concern of theoretical reasoning for favourable action as such. Having drawn these distinctions, Dancy identifies that it is tempting to think about practical reasoning as instrumental; to think that it involves reasoning from an end to the means to that end. The logic of instrumental practical reasoning would take one of two possible forms: either reasoning to necessary means, or reasoning to sufficient means. An attraction of these possibilities is that practical reasoning would seem to have a logic that is analogous to the logic that shapes formal deductive reasoning and theoretical reasoning. However, Dancy is critical of this analogy. Dancy identifies a form of instrumental reasoning in the work of John Broome. According to Broome, theoretical reasoning is a causal mental process in which one reasons from one's current beliefs to one's new beliefs: the process of theoretical reasoning is grounded in the semantic relations which exist between the propositional content of one's beliefs. On this view, theoretical reasoning operates with propositions to make derivations from them: the process of theoretical reasoning is deductive, algorithmic, and computational. For Broome, the key difference between theoretical and practical reasoning is that practical reasoning involves not only beliefs, but also intentions, so far as one intends an end. Because both processes are on this view deductive, algorithmic, and computational, Broome appears to think that both theoretical and practical reasoning are governed by a rule that is grounded in a rational requirement, a breach of which would make for incorrect reasoning about the means to an end, a breach of which would be irrational. Having outlined Broome's account, Dancy explains that he thinks that reasoning to a sufficient means to an end, rather than to a necessary means to an end, is not deductive, algorithmic, and computational, except in the very weak sense that some propositional content may be involved some of the time. Dancy notes, for example, that there is an important distinction to be drawn between cases which require one to choose between multiple sufficient means to an end one intends, and cases which require one to choose the necessary means to an end. Dancy thinks that in certain cases there may be multiple sufficient means from which to choose and that the only rational requirement would be to choose one of them. It appears to Dancy, therefore, that Broome's instrumentalist account obtains only in certain conditions. By way of providing a constructive response to this problem, Dancy offers an account of practical reasoning to which he introduces the criterion of 'favourableness'. Dancy thinks that one can choose between multiple sufficient means by identifying a 'favourable' case for a given means, which criterion would intensify an existing case for action which is already available to choose. Under this construction a sufficient means would stand in the same relation to the considerations adduced in practical deliberation about how to act as beliefs would stand to the considerations adduced in theoretical reasoning about the need to act. If Broome is interested merely in the distinction between correct and incorrect practical reasoning, then for Dancy being correct about how to act is a matter of degree. Each author offers a treatment of his or her topic which is equally nuanced. Adrian Staples, Ph.D., Tutor, University of Tasmania.